Tuesday afternoon I finally got the last of the invitations done and sent out. It was a long and tedious process, mainly because everything that could go wrong did: hole-puncher broke, I ran out of envelopes, ran out of web site cards, printer died, and new printer wouldn’t print RSVP cards. In the end, it all came together and it was still worth it. My craft-making skills from school are being put to good use! After hunting around for different ideas on invitation layouts, I finally came across a template I liked and knew I could pull off. The Budget Savvy Bride, Jessica had made her own invitations and was gracious enough to share her InDesign templates. I downloaded those, did a quick mock-up in Photoshop based on the sizes she used and then went to Michael’s to get my cardstock. 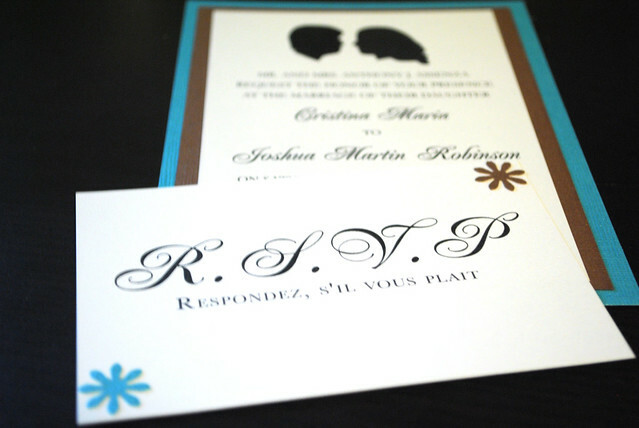 The blue cardstock was 5″x7″, the brown 4.5″x6.5″, and the white was 4.25″x6.25″ along with the RSVP cards being 3.5″x5″. 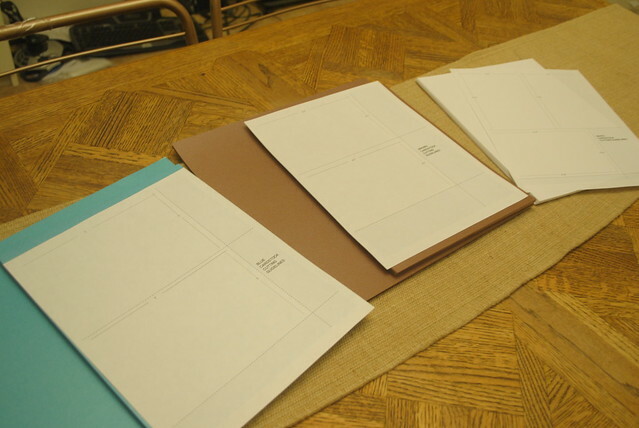 Once I had my cardstcok I printed out my templates and took everything to FedEx Office to get cut. 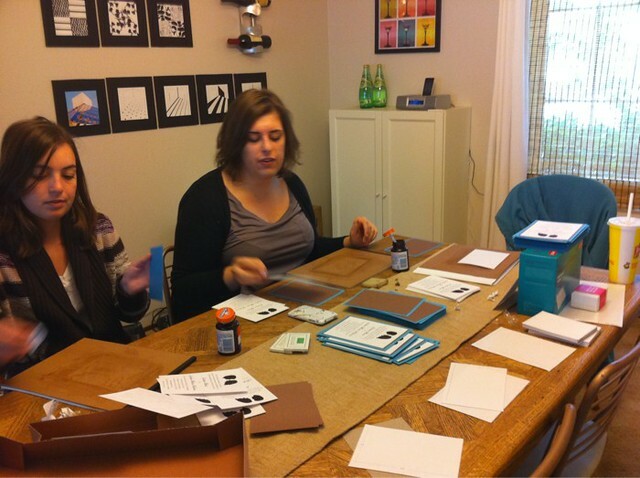 With 3 bottles of rubber cement, my sister and her friend Jackie were nice enough to come over and help put the invitations together. Two weeks went by before I began working on the envelopes and RSVP cards. For awhile I was going back-and-forth on whether or not to do inner envelopes, plus finding nice plain 5×7 envelopes were a pain. The only place that had them was Staples. 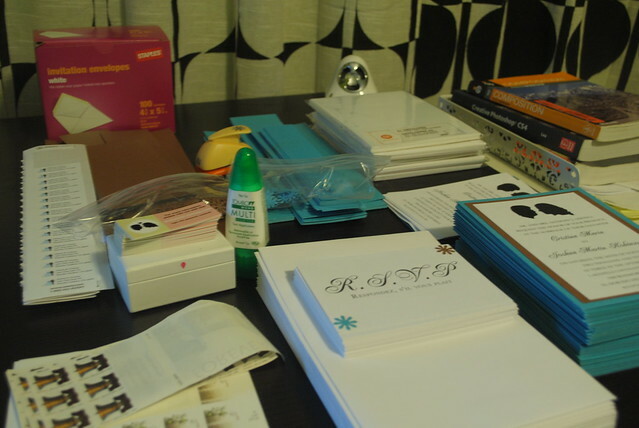 Once I had all my envelopes, I began assembling the whole invitation package. What took so long with the invites was not the invites themselves but the envelopes and RSVP cards. Each one had to be printed out differently based on the party invited; that is what took up most of my time. We have reserved two seats in your honor. In order to avoid people inviting whoever they wanted (we’ve been trying to keep this close friends and family), I stated how many people in the party we had seats for. This was changed based on the number of people I expected in each party. Overall, I am very happy with the way my invitations turned out. I love being able to say, “Yes I designed those!” instead of seeing my invitation kit on the shelves of Michael’s or wherever.